On the go with your laptop means keeping it safe and the iSkin SOHO does just that. With elegant style and cool colors, SOHO features a multi-layered design to absorb the hits and dings that would normally damage your laptop. Made for the MacBook and Macbook Pro, the SOHO's distinguished good looks, coupled with legendary iSkin fit and finish, makes it the perfect accessory for your laptop and your outfit. It also fits PC's with similar dimensions. Right down to the zipper. Zipping around town means you need quick access to your computer. The SOHO features an iSkin designed ergonomic zipper that's easy to grab and pull. It also looks great! Combined with the iSkin ProTouch Keyboard Protector, the SOHO is ideal for students, business users and just about anyone who prefers to be anywhere but at a desk. It also makes a great heat barrier when using your MacBook on your lap. Quality/Usability : I have been on a hunt to find that perfect notebook sleeve to carry my Macbook instead of lugging around my North Face laptop backpack. I didnt want anything too bulky and simple but at the same time, being stylish. iSkin's SOHO seems to fit the bill. iSkin is known for the iPod cases and their PSP carry cases. 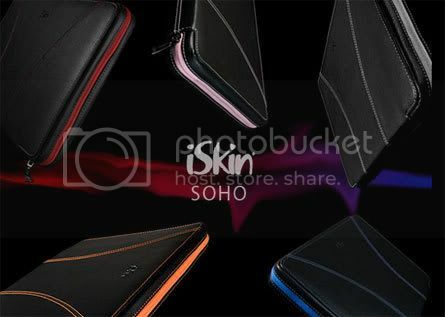 The iSkin SOHO is made of black "premium synthetic leather" with colored stitching and colored lining all around. The outer hard shell and inner lining protects your precious laptop from everyday hazards such as minor scratches, bumps and spills. The sides where the zipper is located does not offer much protection like the outer hard shell but dont worry, the zipper does not touch laptop either as it is also lined. The zipper contains a iSkin logo but it would have been nice if it included two zippers instead of one. The SOHO also protects your lap from the heat coming from the bottom of your notebook. What I also like about the SOHO compared to some other sleeves on the market is that you can use your notebook while its in the sleeve since it has two elastic bands on the top of the case. So when you open the SOHO, the lid of your notebook also opens at the same time. The inner lining is the same color as the zipper and stitching and also has "iSkin" imprinted all over. The SOHO fits perfectly around the Macbook without adding much bulk but still giving ample protection at the same time. You can also place this into a carry bag or backpack without a problem. But I feel that the SOHO is mainly aimed towards Apple laptops rather than PC laptops. CAUTION: Remove the laptop from the SOHO while connected to an external monitor or when used for extended periods of time. iSkin is not responsible for damage caused to your laptop when used with this product. Conclusion : Overall, the iSkin SOHO Macbook Sleeve Case is great for any college student or a freelancer like me who meets clients every so often. Its elegant and nothing too flashy or fancy on the eyes. Since this is a sleeve case, there are no additional pockets and no strap, so holding it may cause you to drop it. So if you carrying a mouse, charger and other accessories with you, you'll need to carry a bag with you. I no longer have to expose my Macbook to potential damage and its easier to use on public transportation. Its so convenient...just unzip and open. No more removing laptop from sleeve and having to shove it back in when I'm done or rushing to get off train/bus. Just close and zip it up. Although its probably the best looking and best protecting case, the price will hurt your wallet compared to others out there. Its either spend a little bit extra and know you're getting protection or take the risk of buying something cheaper and potentially damaging your laptop and having to buy a new one later on.